The Hairy Woodpecker (Picoides villosus) is a medium-sized woodpecker, averaging approximately 250 mm (9.75 inches) in length with a 380 mm (15 inch) wingspan. 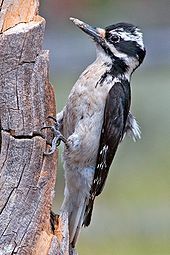 With an estimated population in 2003 of over nine million individuals, the Hairy Woodpecker is listed by the IUCN as a species of least concern in North America. The Hairy Woodpecker inhabits mature deciduous forests in the Bahamas, Canada, Costa Rica, El Salvador, Guatemala, Honduras, Mexico, Nicaragua, Panama, Puerto Rico, Saint Pierre and Miquelon, Turks and Caicos Islands, and the United States. Mating pairs will excavate a hole in a tree, where they will tend to, on average, four white eggs. The Hairy Woodpecker measures from 18–26 cm (7.1–10 in) in length, 33–43 cm (13–17 in) in wingspan and 40–95 g (1.4–3.4 oz) in weight. It is virtually identical in plumage to the much smaller Downy Woodpecker. The Downy has a shorter bill relative to the size of its head which is, other than size and voice, the best way to distinguish them in the field. These two species are not closely related, however, and are likely to be separated in different genera. The best way to tell the two species apart other than the size is the lack of spots on its white tail feathers (which the Downy has). Their outward similarity is a spectacular example of convergent evolution. As to why this convergence has evolved, only tentative hypotheses have been advanced; in any case due to the considerable size difference, ecological competition between the two species is rather slight. These birds forage on trees, often turning over bark or excavating to uncover insects. They mainly eat insects, also fruits, berries and nuts, sometimes tree sap. They are also known to peck at wooden window frames and wood sided homes that may house bugs. Downy woodpecker - A smaller but very similar-looking species. ^ BirdLife International (2012). "Picoides villosus". IUCN Red List of Threatened Species. Version 2012.1. International Union for Conservation of Nature. Retrieved 16 July 2012. ^ a b Sibley, David Allen (2003). The Sibley Field Guide to Birds of Eastern North America. Alfred A. Knopf, Inc. p. 249. ISBN 0-679-45120-X. ^ a b "Picoides villosus". International Union for Conservation of Nature and Natural Resources. Retrieved 2009-03-24. ^ a b Bull, John; Farrand, Jr., John (August 1994) . National Audubon Society Field Guide to North American Birds:Eastern region (2nd ed.). Chanticleer Press. p. 573. ISBN 0-679-42852-6. ^ Hairy Woodpecker, All About Birds. Wikimedia Commons has media related to Picoides villosus.